I've searched all over my data for a coding error, (which my adviser said is the most likely culprit), but I can't find anything amiss. Are there any other conditions that might explain this? I am using robust standard errors in both models. Thank you for your help! Also apologies if I'm not including enough information, this is my first time with this site. As per @Isabella-Ghement's comment in the answer, here are the plots I produced for both the LPM and Logit models she described in the answer. There's nothing like plotting your data to get some insights into what might be going on. 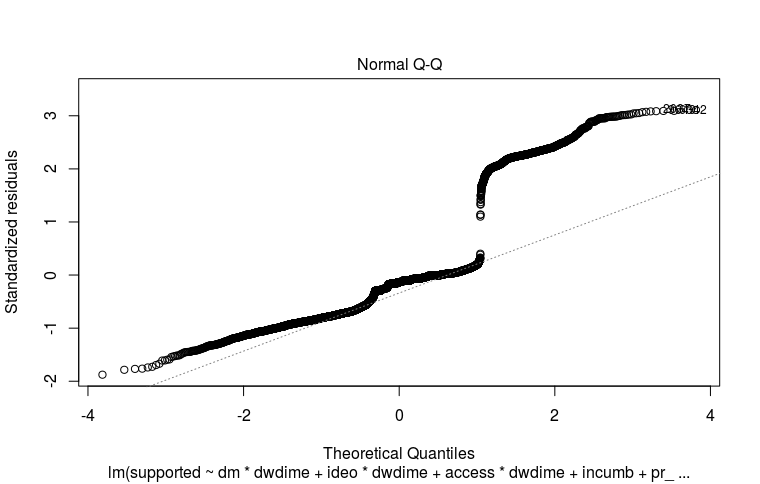 For the LPM model (linear probability model), you want to plot your DV versus CONT separately for each of the values of DUMMY, where CONT is the continuous predictor and DUMMY is the dummy predictor variable. When DUMMY = 0, the plot of DV against CONT would look similar to the first plot listed on this page: How to plot binary (presence/absence - 1/0) data against continuous variables. 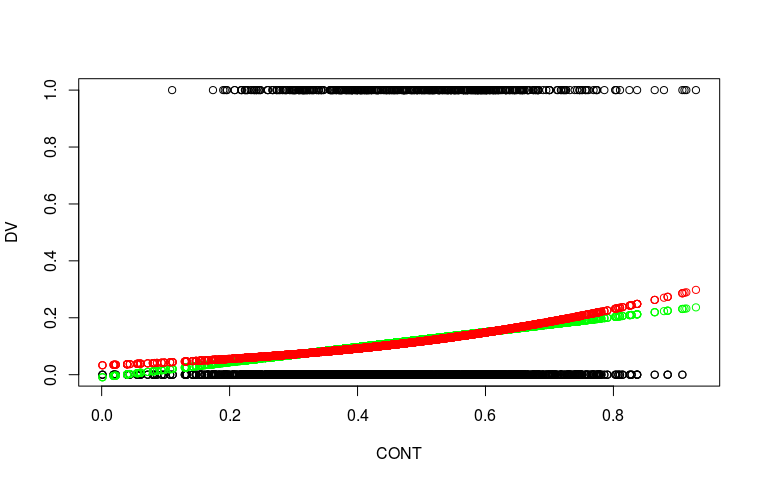 When DUMMY = 1, the plot will change appearance but it will follow the same visual style. For both plots, DV should be plotted on the Y axis and CONT on the X axis. After fitting this model to the data, you can obtain the estimated values of the coefficients beta0, beta1, beta2 and beta3 - let's call them b0 through b3. 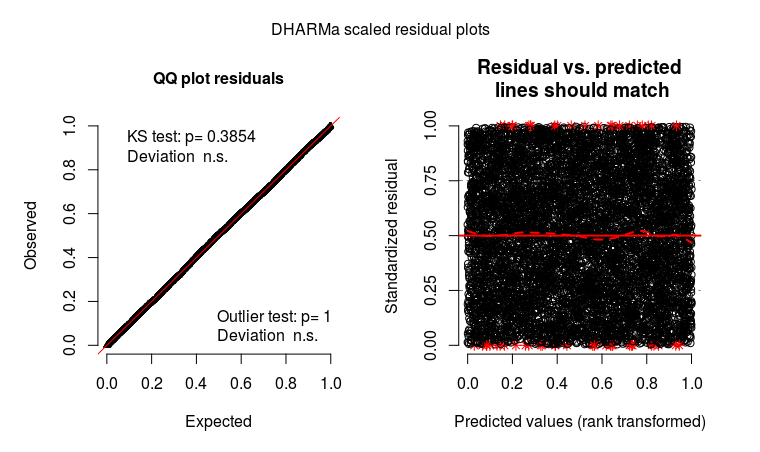 Using this information, you can add a fitted regression line to each of your two plots. That line will depict how the estimated probability that DV = 1 changes with the values of CONT when DUMMY = 0 and when DUMMY = 1, respectively. The end plots should look similar to the plot located in the left panel of the first figure found in the document available at https://are.berkeley.edu/courses/EEP118/fall2010/section/13/Section%2013%20Handout%20Solved.pdf (except the plots will show both the data and the fitted probability line). (b0 + b2) + (b1 + b3)*CONT versus CONT for DUMMY = 1. Since your LPM model includes an interaction term, you would expect the two lines to potentially have different slopes. in the appropriate plot of DV versus CONT. The fitted probability curves should look similar to the plot located in the right panel of the first figure found in the document available at https://are.berkeley.edu/courses/EEP118/fall2010/section/13/Section%2013%20Handout%20Solved.pdf (except the plots will also show both the data and the fitted probability line produced by the LPM model). 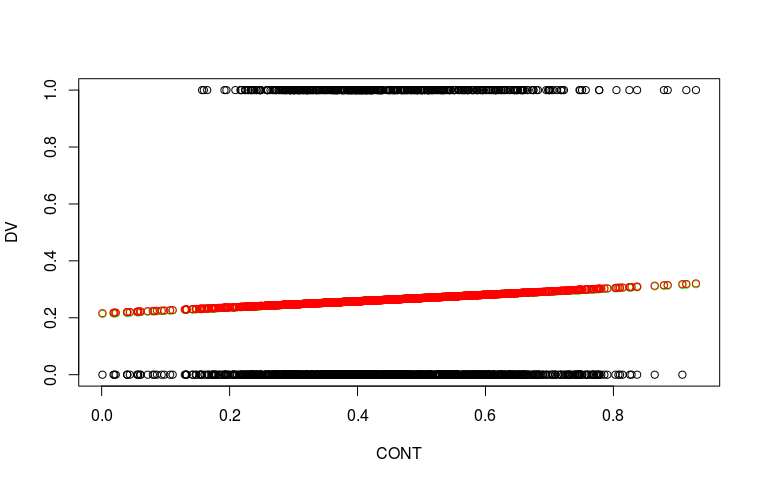 You should be on the lookout for two types of patterns in your data for each plot (recall that one plot corresponds to DUMMY = 0 and the other to DUMMY = 1). In scenario A, you would expect CONT to have a positive linear effect on the probability that Y = 1 for the LPM model and a positive nonlinear effect on the same probability. In scenario B, you would expect CONT to have a negative linear effect on the probability that Y = 1 for the LPM model and a negative nonlinear effect on the same probability. In general, I agree with your supervisor that if you encounter patterns such as the ones described in the above scenarios in your plots, you would intuitively expect the fitted probability line produced by LPM and the fitted probability curve produced by the logistic regression model to follow the same direction (e.g., both positive or both negative). If that is not the case, one of the models is not appropriate for the data - most likely, the LPM model. In any event, plotting your data will reveal if you have any other issues in the DV data that might affect the LPM model fit - for instance, the majority of your DV data values are equal to 0 (or perhaps the majority are equal to 1). Or there could be issues with your CONT variable - too narrow a range of values; only a few distinct values; outliers or gaps in its distribution; etc. Not the answer you're looking for? Browse other questions tagged regression least-squares logit or ask your own question. How to explain change of sign on regression coefficient when another variable is added to OLS model? Sign change of a coefficient in logistic regression? Why coefficient changes sign between linear and logistic regression? What can cause a “wrong” sign coefficient in a logistic regression?